Humansdorp Custer commander, Brigadier Neil Jantjies introduced the new St Francis Bay station commander to the community , 23 August. The new station commander, Captain Nyameka Gomoshe who has just moved over to St Francis from Jeffreys Bay SAP, brings with her over 22 years of police experience. Sgt Nkohli from the Uitenhage police cluster under which St Francis and Kouga falls, with Captain Gomoshe. A single mother of one, she joined the SAPS as a student in 1994 and has served in numerous police stations in the Eastern Cape. After completing her basic police training at the Mthatha Police Academy, she started her police career as a constable at the Ngangelizwe SAPS. From then on there was stopping this dedicated police woman from serving and protecting. In 2000, she was promoted into a rank of sergeant and seven years later joined Jeffrey’s Bay SAPS as a relief commander in the rank of warrant officer. In her policing career she has served in various components such as visible policing and detectives. She haw undergone in-service management courses. This softly-spoken commander has assured the community of St Francis Bay of safety and security and also promised to strengthen relations with community forums. The new commander wasted no time this morning in St Francis. Immediately after the ceremony she joined cluster women’s network operation basadi, which involved door-to-door campaign against domestic violence with pamphlets distribution in hot-spot areas of St Francis Bay. 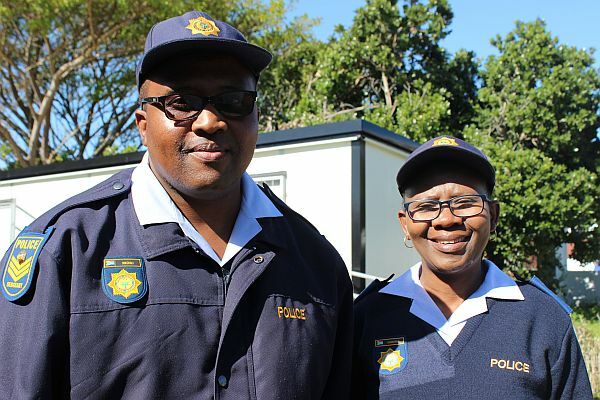 St Francis Bay police women ready for operation basadi..